We had our surgical consult with Bodie's surgeon today. Finding the good in a surgical consult is a little like finding the good in getting a $500 speeding ticket. You have to go with "hey, at least I have a car to speed in" or "well, at least it wasn't a ticket for crossing a double yellow line into the carpool line while speeding, with 15 people in the backseat sans seat belts." Ya gotta dig deep. That's kind of like what it's like to have a consult with a surgeon who's going to be performing open heart surgery on your preschooler. It's not exactly a great experience any way you cut it. So you gotta dig deep to find the good. But I will say, as far as surgical consults go, today actually went well. We didn't hear anything we didn't already know, which was good. We're all set for pre-op on Friday, July 26th with the Fontan on July 29th. And, in true Bodie fashion, he provided some memorable moments. Like, when the nurse practitioner wanted to see his groin incision, since we had mentioned he had a allergic rash from the cath. I asked Bodie if he would show it to her, imagining that I would help him pull down his shorts a bit. Nope. He proceeded to turn to her and full on drop trow. No shame with this kid, I tell ya. I guess the bright side is he was cooperative. He plans to do a fenestrated extra-cardiac Fontan on Bodie. A fenestration is essentially a pop-off valve of sorts, that will still allow for some mixing of deoxygenated and oxygenated blood; there is a big school of thought that believes fenestration allows the body to adjust easier to the new Fontan circulation and may possibly avoid complications later. There was some question about not doing a fenestration since Bodie's pressures had looked good during his cath. But, it seems to makes the most sense for 2 reasons - (1) Bodie has a history of "twitchy lungs," that generally don't respond particularly well to being messed with. Because of this, hemodynamically, he's probably a better candidate for the fenestration, to allow those lungs time to adjust to the new circulation. (2) leaving a larger fenestration could allow continued access to the right ventricle. Given Bodie's penchant for rhythm issues, maintaining access to that ventricle for future ablations might be important. So, should Bodie's EP need to attempt another ablation, he could go in through the fenestration to access the heart. The "plan" is to close the fenestration in the cath lab in 3-4 years. This means that Bodie's 02 sats post-Fontan won't be quite as high as we had hoped (rather than being close to 100%, he'll probably be closer to the low 90's due to the mixing of blood). That part is a bummer, but it's pretty clear that it's what's best for Bodie long-term, so we're ok with that. Every kid with the Fontan is different, but he did give us some ballpark expectations, assuming things go well. We can expect 7-10 days in the hospital (longer if his body has a hard time adjusting to the new circulation; some kids do). He gave about a 50/50 chance Bodie will come back from the OR on the ventilator. Most kids come back from the Fontan already extubated, but with Bodie's history of lung issues, we were already expecting him to come back intubated and on nitric oxide. The good news is, even if he does, they'll try to extubate as quickly as they can. Statistics are fairly useless, since they don't give you much comfort if you fall on the wrong side of them, but we did ask and were told there's about a 1-2% of something major going wrong during the Fontan surgery in general, and that number increases slightly with the Fenestration, to maybe 2-3%. 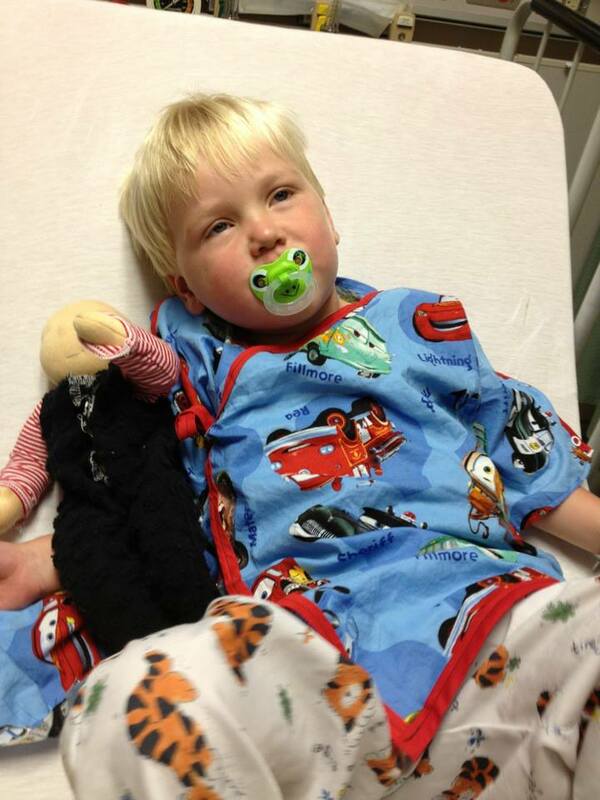 Definitely in our favor, which is comforting - please be praying for Bodie not to have ANY major complications. Bodie's surgeon routinely puts post-Fontan kids on Coumadin prophylactically, to reduce the risk of clots forming along the conduit that is placed. If you don't know much about Coumadin, it's a blood thinner that requires weekly blood draws and careful adherence to diet (i.e. no leafy green vegetables). Oh, and wait - the best part is that it really thins your blood, so you have to be careful about head injuries. Super awesome for a kid like Bodie, who falls and hits his head at least once a week as it is. When I told our surgeon that Bodie has the awesome combination of lack of core strength, terrible spacial awareness and no impulse control, he started laughing and agreed that perhaps Bodie wasn't the best candidate for Coumadin. So, the plan, unless he has an emergent situation requiring Coumadin, is just to manage him post-operatively with aspirin alone. HUGE win! So excited about this one! As always, we so appreciate your prayers and covet them in the weeks ahead. Bodie has a runny nose right now; please pray that his body moves through this cold quickly and that it's long gone well before surgery time. We'll also be providing info soon about how to make a directed blood donation for Bodie's surgery, so be looking for that! 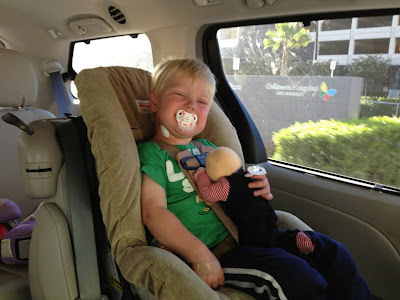 After our 6-hour "flat on his back" wait yesterday, CHLA discharged us at 6:30 last night! We picked up Sierra, came home, put both kids in bed - and everyone (including Dusk and I) was asleep by 9:30 or so! What a day! Today, Bodie is doing awesome. We changed his dressings this morning and he's left with only a couple of bandaids (and a little adhesive residue) and some puffiness around his eyes. Other than that, you would honestly never know what he went through yesterday. He's pretty much 100% back to normal. Praise God!! On the whole, yesterday went SO MUCH better than we were anticipating. 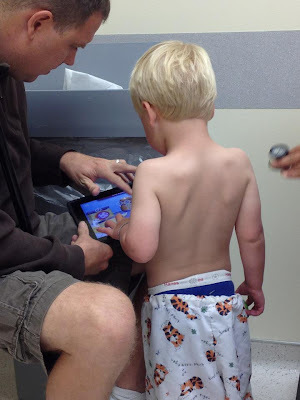 I wouldn't describe it as "easy-peasy" (I mean, really, handing your child over for a procedure like that could never be described as easy-peasy), but it was so much better than all of the scenarios we had in mind going in. The waiting wasn't too bad. We knew Bodie was in good hands and that they would update us when they could. The cath part went super fast (they had told us to expect 2-3 hours; they called us 90 minutes later to tell us they were done and to come upstairs!). And the EP part took longer than we were anticipating, but we knew Bodie was in such good hands and we appreciated that they were being extra careful and thorough, so the waiting didn't seem so bad. The first couple of hours in post-op recovery were tough, with Bodie waking up and thrashing and screaming as he was coming out of the anesthesia. But, really, if I was coming off drugs to find myself with an iv in my hand, painful wrappings on my neck and groin and my legs caught in a vice-like bandage wrapped around them keeping them straight, I'd probably be a bit feisty, too. ;-) I'd say that was all to be expected. I would say that yesterday gave us great hope for the Fontan. Of course it will be much tougher and much much more nerve wracking, since OHS is a whole different ballgame than just a cath. But yesterday reassured us that (1) Bodie is resilient, (2) his body is strong, (3) hemodynamically, he is ready for the Fontan, and (4) together, Dusk, Bodie and I make a great team and we'll get through it. And we just have to give a HUGE shout-out to CHLA's Electrophysiology team. We knew Bodie's Electrophysiologist was good, but seeing him in action yesterday just gave us a whole new level of respect for him and their entire EP department. Bodie is crazy complex with his arrhythmias and there are probably only a few doctors in this country who could really figure him out and treat him effectively. And his EP is definitely one of them. Not only is he brilliant, but he is unbelievably good in the cath lab, anticipating every complication and double and triple checking things to create the least risk possible for Bodie. He looked fairly exhausted when he came out; suffice it to say, Bodie gave him a run for his money. It is so easy to take for granted these types of procedures, but really, reflecting back on yesterday, I have to say that I am totally in awe of CHLA's EP department. I feel so so blessed that Bodie happens to be treated at a hospital that has not only a great CT department, but also a top notch EP department. Thank you SO Much to everyone who was praying for us yesterday! We know that is the only reason things went so smoothly! We continue to be so grateful to God for his ever protective hand over our son. 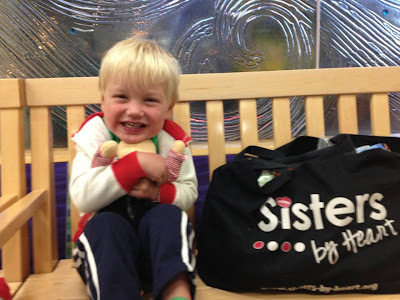 Bodie's EP study and ablation are complete. We just finished meeting with Bodie's Electrophysiologist. It's pretty complicated, but he seems pretty confident he successfully ablated the node that was causing Bodie's prolonged episodes of EAT. When they finished that part of the ablation, however, they did catch another part of the heart that was generating short runs of EAT (2 beats or so at a time). They were not able to ablate that node. So we're kind of in a wait and see mode for now. If that second spot just remains in the 2 beat intervals, it'll be a nonissue and the ablation will have been completely successful. If however, the intervals become prolonged on that 2nd spot, we'll have to reassess. Because we don't know what is causing Bodie's EAT at this point, we don't know what camp we'll fall into. Either it was a one time thing (likely due to CHD in general) or it will be a reoccurring problem (likely inherited from Dusk as part of his left ventricular non-compaction). We plan to do genetic testing in the near future to try to get a better idea of that. For now, we wait. But, in the words of Bodie's EP "Bodie's ok and we may have made him a whole lot better today." That, we will gladly take. Oh, and no more Atenolol or Amiodarone!!! Praise God! We haven't seen him yet (they say he's still sleeping), but hope to see him soon! We got a call from the cath lab a little while ago. As it turns out, not only were they able to induce Bodie's EAT, but they were also able to locate it, start and stop it. This is huge. As Bodie's Electrophysiologist explained this morning, it was pretty unlikely that he'd be able to induce Bodie's EAT, because it is just so.stinking.unpredictable. BUT, if he could induce it and get it to stay long enough to figure out where exactly it was coming from, he thought it was highly likely he would be able to ablate it. So, that's where we're currently at- they've triggered the EAT, located the source and are now in the process of trying to essentially kill the node of the heart that's causing Bodie's EAT. We know it's not a guarantee that they'll get it (or that it won't come back there or somewhere else in his heart at a later date), but it would be such a HUGE answer to prayer to at least get rid of it for now and not have it be an issue for his Fontan. So, please keep those prayers coming as the docs are doing a very delicate procedure on our special little guy's tiny little heart. Cath results are in (EP study still underway) Everything looks FANTASTIC!!! Nice big arteries and lung pressures are great! Excellent Fontan candidate! NO TV regurgitation to speak of and almost no AV regurg! No Significant collaterals! Praise God!! We're heading upstairs to meet with the cardiologist now to review the results! His EP study is now underway. In the meantime, here is the video of Bodie I referenced. After a pretty uneventful pre-op, Bodie's cath is officially underway! I have to say, waking up at 4:15 (or, well, you know, 3:50, when I finally gave up on getting back to sleep after Bodie had kicked me awake for the 50th time, and just got out of bed) is no joke. At least for Dusk and I. Bodie, on the other hand, was all chatterbox all the way to the hospital and 100 kinds of flirty with the nurses and docs. What a super kid he is. So excited for what the day brings! So this shirt might officially qualify under the "name it and claim it" doctrine, but whatevs. 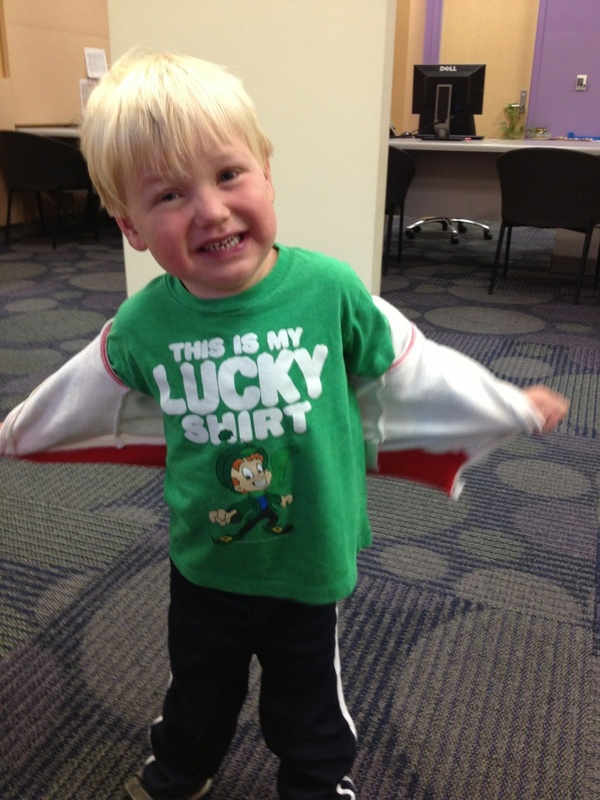 We're claiming it his lucky shirt and today his lucky day. Bodie did FANTASTIC during pre-op, even with the nurse who insisted we needed to check Bodie's sats again, because "that number there" (aka his 02 sat of 82 (heck yeah! We'll take that!)) "should be in the 90's" (and that was AFTER I had already told her his baseline sats were 75-85!). But I digress. He did super, holding out his arm for the blood pressure, easily giving his finger for the sat check, and showing off his uber cuteness to anyone who would pay attention. There were kids crying all over the place, but not Bodie - he was just happy as could be. Well, except for not wanting to wear his awesome hospital gown handmade by our dear friend and heart mama, Natasha. He, apparently, prefers to go gangsta style. So yes, this is is how we walked through the hospital from downstairs pre-op to upstairs pre-op/anesthesia prep. No shirt, boxers hanging out, pants riding low. But whatevs. Bigger fish to fry peeps, bigger fish to fry. He was NOT keen on the Versed, which apparently tastes really nasty. He took one taste and was having none of it. But I was so proud of him. After just a little talking and agreeing that he could keep his binkie in while he took it, he took it like a champ in one swig. Have I mentioned how proud of this kid I am? So then, we waited (and played iPad - have I mentioned how helpful that thing is???) for it to kick in. And kick in it did...we have a hilarious video of his antics once the Versed kicked in. He couldn't even keep his head up. "Relaxed" doesn't even cover how he was feeling. But, alas, youtube is taking 1,000 years to "process" it. Lame. We'll post that once Youtube finally gets its act together. He did GREAT with the handoff - didn't even care (not sure he'd have cared about anything at that point, to be honest). We tucked him in with his Joshie Doll and he was on his way. When we turned to leave, he was playing peek-a-boo with the nurse as she was wheeling him down the hall. Ok, peek-a-boo might be a stretch given his drink stupor. He was putting the blanket over his head and trying to remove it and slurring something along the lines of peek-a-boo. Everyone was cracking up. Have I mentioned how much we love this kid? So now we wait. The diagnostic cath will be first and hopefully, we'll have results on that in a few hours. Then they'll do the EP study. We likely won't have any updates before then. It's shaping up to be a long day. Please keep little man in your prayers - we love him and are so hopeful for good results today! This is my child, who I have prayed over while he grew in my belly, perfect and beautiful, specially chosen by God to reflect His glory and grace in his brokenness, his imperfect body. This is my child, who I have cried over, who I have agonized over, who I have laid beside and begged to breathe, to fight to live, as a fragile newborn. This is my child, who I have hit my knees over, time and time again, begging God to spare him, to let us keep him and love him. This is my child, who I have willed to eat, to take medicine, to crawl, to walk, to talk, to push himself beyond what anyone thought he should be capable of. But those days are just a shadow now. Today, this is my child, who now runs through my halls, having pillow fights with his sister and daddy, and riding his tricycle, and climbing and digging and laughing. This is my child, who lives every inch of his life with more passion than most people a lifetime older than him. This is my child, who talks of having a dog, and going to kindergarten and playing soccer someday. 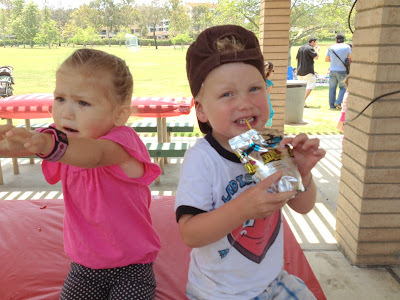 This is my child, who loves and adores his sister with every ounce of his being. So when you ask me how I’d doing, facing tomorrow’s cath and next month’s surgery, I will smile and say “I’m fine.” As a believer, as a daughter of God, I am fine. I know NOTHING is going to happen tomorrow or next month that He does not know about, that He has not ordained. I know He loves my son far more than his father and I could ever imagine. But I am a mother. And this is my child. My arms ache when he is at home with the sitter and I am at work and I cannot run to hug him. How much harder it will be when it is not just a sitter, and a job, that separates us. But an anesthesiologist, and a doctor, and an OR…and countless machines and life giving medications. I know this, all of this, is necessary for my son to have the best shot he can at the life God has called him to. We have always known that, since before we ever even met our sweet Bodie in person. But my mother’s heart breaks over this. So tomorrow and on July 29th, and every day in between and following, please pray for my son, for his heart, for his mind, for his spirit. And for my mother’s heart. Because this is my child. And he is my whole world. So. Bodie's cath is scheduled for next Tuesday, June 18th. As of right now, our call time is 7:30am, which means we need to be there at 5:30am (yes, for those of you who know where we live, that means we'll be leaving around 4:45am - lucky us! but let's face it, we all know Dusk and I won't be getting any sleep anyway!) They're going to call to confirm on Friday, but if all goes according to plan, we will be the first and only case on Tuesday morning. Around here, we're pretty blasé about caths, because, you know, they're so non-invasive. Which begs the question - non-invasive compared to what??? Sure, noninvasive compared to open-heart surgery. But, let's be honest, being hit by a mack truck is noninvasive compared to open-heart surgery. There aren't a lot of things that seem gnarly when you're comparing them to OHS. But I digress. His cath will be less invasive than OHS for sure. But it's not without risk. Here's how it should go down. We'll get to the hospital (Bodie will be allowed clear liquids/water up until 2 hours before his call time, so hopefully, he won't be too grouchy) and hang out in pre-op for awhile. They'll give him one final check to make sure he's good for the procedure, then give him some Versed (otherwise known as "happy meds"), which should make him feel like he's drunk to hopefully make the transition a little easier. Too bad they don't give it to the parents as well. :-( I don't know whether we'll be able to walk him all the way into the cath lab, or hand him off to someone outside of the cath lab. Either way, hopefully the Versed will take the edge off and make handing him off easier for him (there's no amount of meds in the world that would make the handoff easier for us). Then, they'll completely sedate him and put the lines in. He'll have lines in his neck and his groin I believe. They'll insert a long, flexible tube (catheter) is into the veins and guide them into the heart, allowing a close look at the structures inside. Once in there, they'll inject dye into the heart, observing blood flow and calculating all pressures within the heart. This will give them a good idea about whether Bodie is actually a good candidate for the Fontan or not (we're all hoping and assuming he will be, but we won't know for sure until they do the cath). At this time, they may or may not coil any large collaterals they see that they believe might hinder the success of his Fontan surgery. At this point, the diagnostic part will be done. Then, his Electrophsysiologist will step in. He will use the same catheters (I think) to try to induce Bodie's EAT. If he is successful, then he will swap out the catheters for much larger ones to attempt the ablation. During the ablation, he will attempt to locate the node causing the EAT. If he is able to find it, he will attempt to ablate it (essentially to cauterize or burn the node). If he is successful, he should be able to tell us the likelihood that it will return. Are you sensing a reoccurring theme? If if if. Doesn't sit so well with my OCD-must-be-in-control temperment. Ah, well, if Bodie has taught me nothing else, it is that my sense of control is all an illusion. Good thing I know that God is actually the one in control, not me! After that, Bodie will be brought back to post-op recovery, where Dusk and I can see him again. Then, the really fun part starts. We will have to keep him calm and as flat on his back as possible for 6 hours. Yes, you read that right. 6 HOURS. Anyone who knows Bodie and has seen him in action can stop laughing now. It's not gonna happen unless we get a miracle. So, let's all pray for that. We are told that everyone expects it to be an outpatient procedure. Everyone, apparently, except for the scheduling lady. When she called this week, she mentioned offhand that they'll have a room ready for us. Awesome. Guess I'm not the only one prepared for Bodie to be unpredictable. Going home Tuesday night sure would be awesome. But at least we (and they) will be ready for Bodie to stay overnight if need be. We should be discharged Wednesday if that happens. 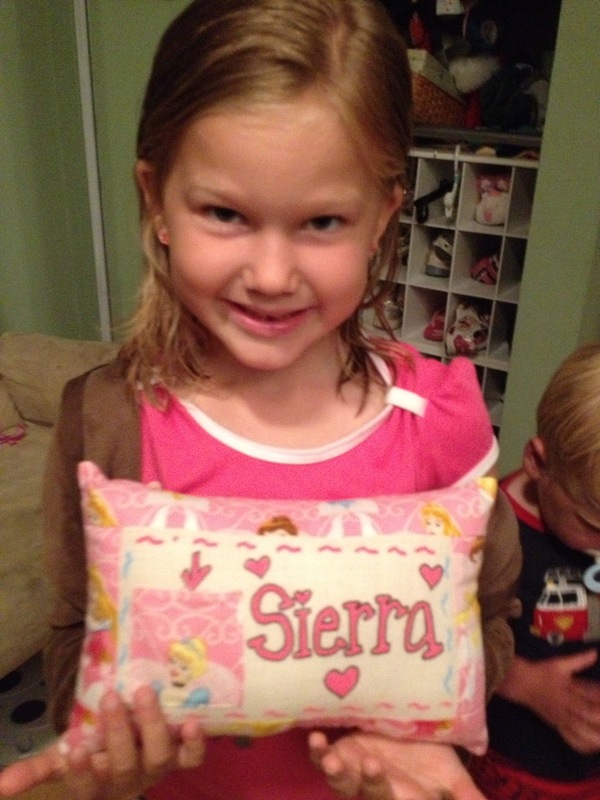 During all of this, Sierra will be staying with her close friend Riley and her awesome family. It will be Sierra's first sleepover! Thank you to the wonderful Phillips family for helping us out - we love you guys! 1. That Bodie stays healthy until the cath. Please no last minute bugs for him! 2. That nothing else causes the cath to be rescheduled. 3. That he is able to be handed off easily. 4. That the diagnostic part of the cath goes smoothly (please no cardiac arrests this time around!!!). 5. That the diagnostic part of the cath reveals that Bodie is an excellent Fontan candidate (no surprises please). 6. That the ablation goes smoothly - that Bodie's EP is able to trigger the EAT, isolate the node and ablate it. 7. That Bodie sleeps through most of his recovery, and wakes up happy - and that we are able to keep him calm during post-op. 8. That we get to go home Tuesday night. 9. That Bodie's recovery goes well. We expect there to be bruising and some grouchiness as he recovers - pray it doesn't last long! 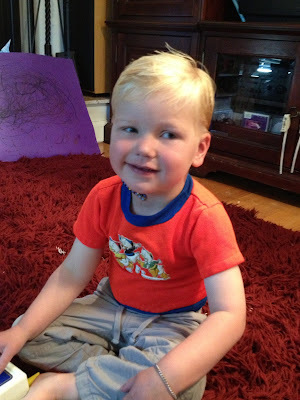 Thank you so much for praying for our little man - it means more to us than we can possibly express!!! Tonight, we had our annual closing ceremonies for the AWANA program our family is a part of. Many church denominations are seeing anywhere from 69 to 94 percent of teens leave the church after high school. As few as one in 10 possesses a biblical view of God and the world. The majority of children from Christian homes leave the church by age 19. If you're a Christian parent, these statistics should scare you. A LOT. By contrast, only 1.8 percent of Awana alumni dropped out of church as adults. Wow. Just wow. So, if your children's spiritual walk is important to you and you have an opportunity to get your children involved in an AWANA program, do it. Just do it. I promise you, you won't regret it! 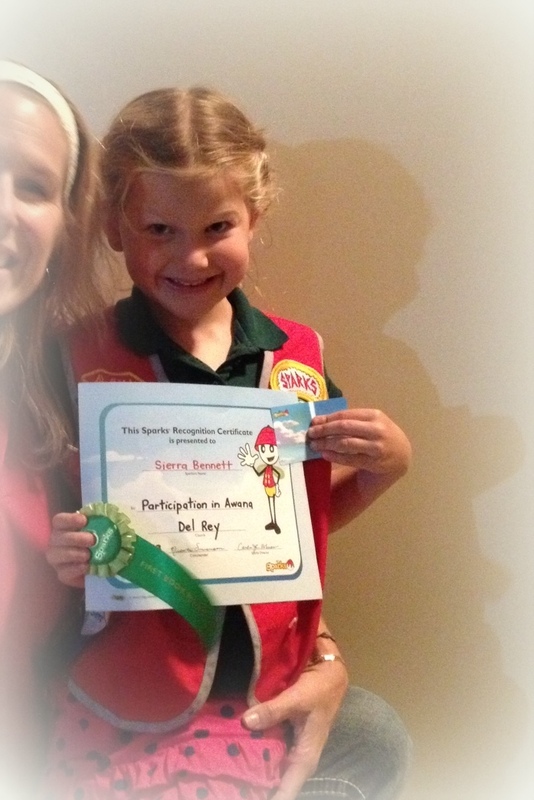 Last year Sierra was finally old enough to formally join AWANA, and she was in Cubbies (pre-k)! Such adorable little kiddos in their blue vests, learning about Jesus and playing games. And this year was her first year as a Sparkie, which is where stuff gets real and they start memorizing verses in earnest! 36 in fact. That's how many verses Sierra memorized this year to complete her first book. Oh, and all the books of the New Testament. And, since she was still a pre-reader until very very recently, that means I memorized those verses right alongside her. How awesome is that?!? And, as my official Sparkie sidekick, Bodie learned his fare share as well, including John 3:16 and the pledge of allegiance that we say every night during Opening Ceremonies. So, if you're a Christian family and not sending your kids to AWANA, why not? It is SO much more than just a youth group. 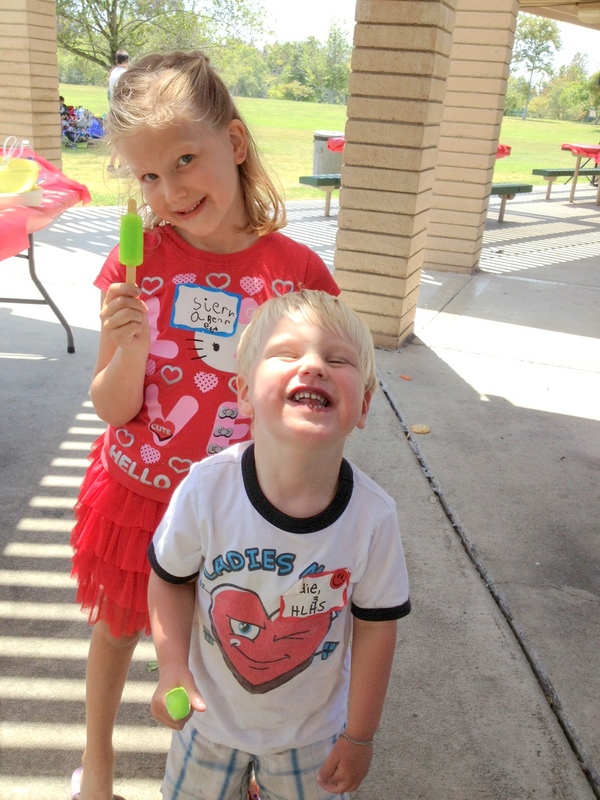 Many weeks, AWANA is the highlight of Sierra and Bodie's week. They get so excited to go memorize Bible verses, play crazy games, have awesome snacks, hear a great message and, of course, leave with candy! What better use of their time than to equip them to be servants of Christ and really get His message and the importance of memorizing scripture? I LOVE that my kids are learning at a fun age that worshiping God and learning His Word is FUN. If you need help finding a club in your area, let me know and I can help you out. And, if you live in LA and want to know more about our club, let me know as well! We're now off for the summer (as a leader, I am SO excited to rest and rejuvenate - and get my Friday nights back to myself for a bit! ), but will be back in full swing in September! 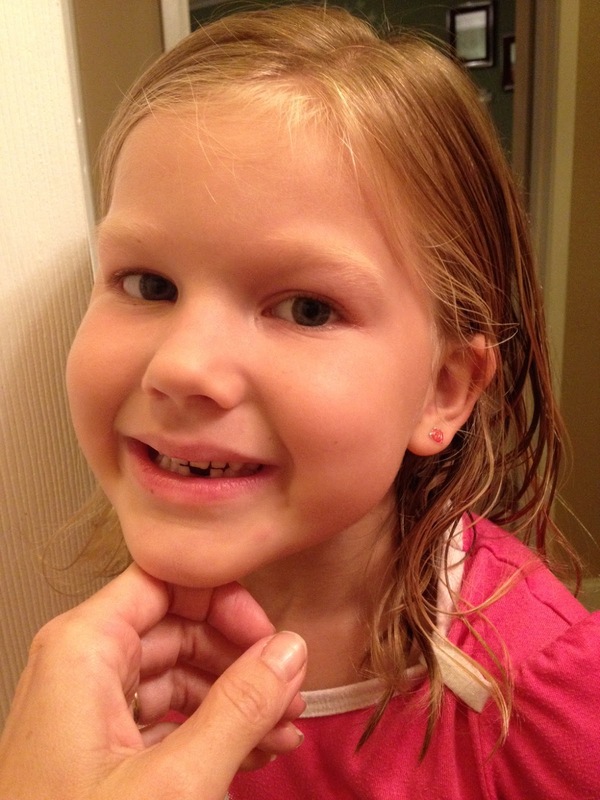 Look out world...somebody just lost her first tooth yesterday!!! This little girl has been jonesing to lose that tooth since school started and she could not be more proud or excited to have that sweet gap in her mouth now. 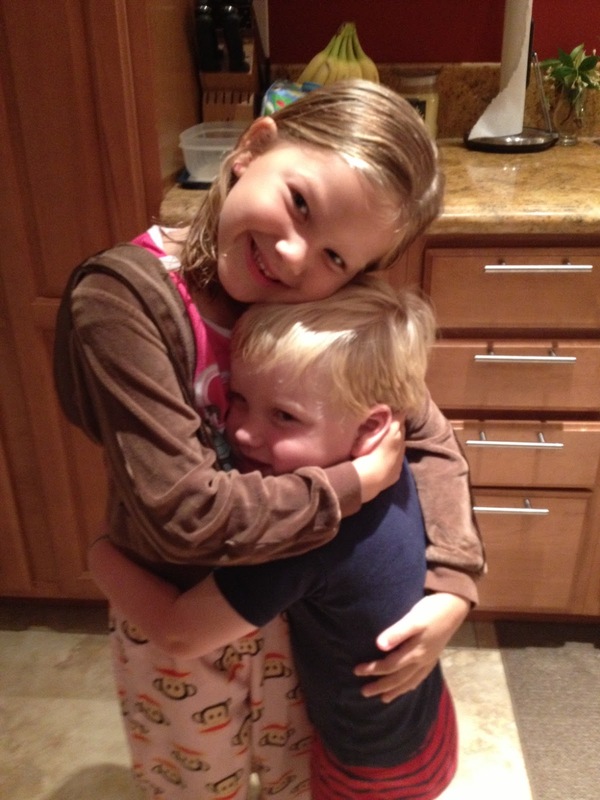 As it turns out, her little brother is pretty excited for her, too. He couldn't wait to give her a congratulatory hug. Today, the kiddos and I trekked down to Irvine (if you know me, you know "trek" is the operative term, since I detest driving anywhere that takes more than 10 minutes!) 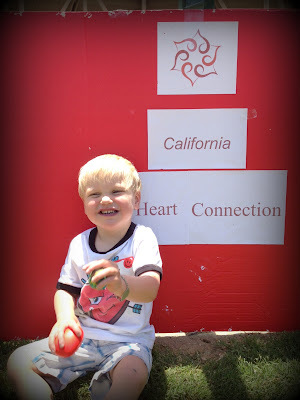 for the annual California Heart Connection picnic. 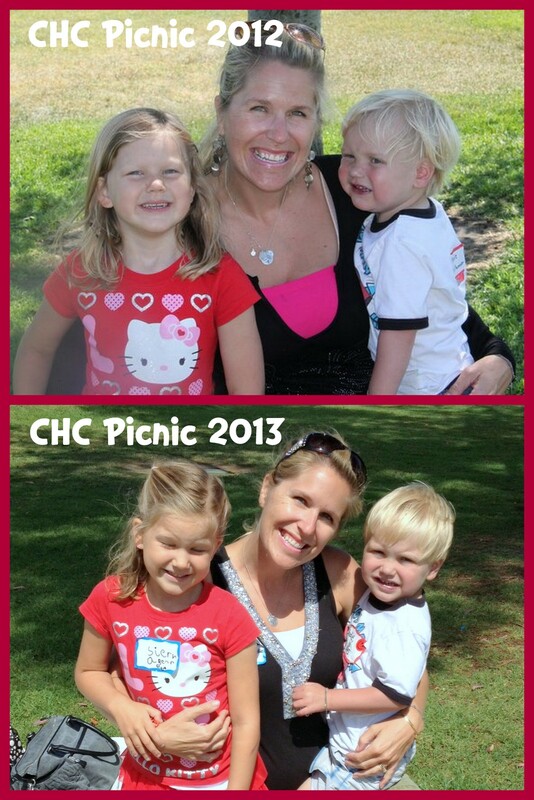 I am SO glad we did - we had SO MUCH FUN!!! If you are a heart parent and haven't found something like this locally to you, you should definitely ask your hospital! 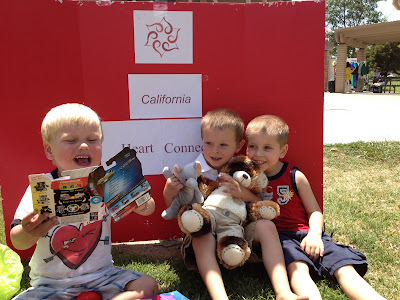 Chances like this to meet other heart kids (and ADULTS!) and families are truly priceless! The kids and I walked away invigorated, inspired...and exhausted!!! And let me just say, BODIE IS CRAZY. I lost him more than once because I stopped to talk to someone and he ran away from me. 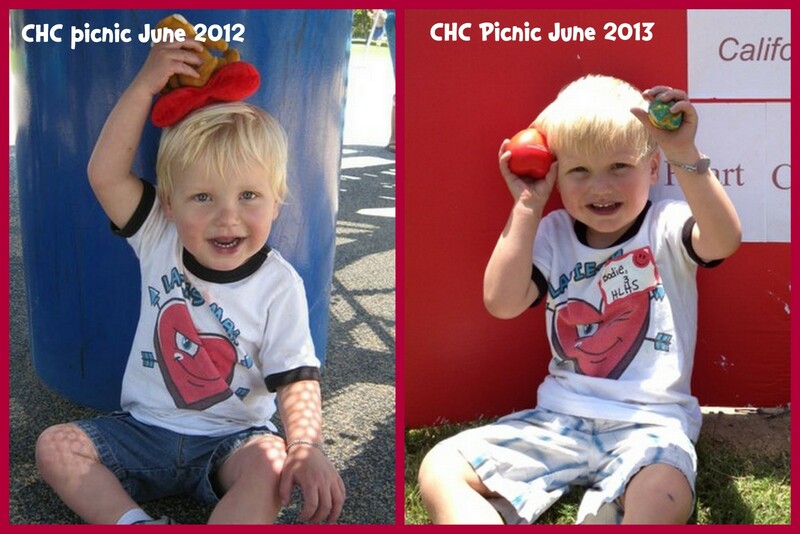 One time, I found him in the next picnic over jumping in their bounce house. True story. Gee I'm super excited this kid will have MORE energy post-Fontan. 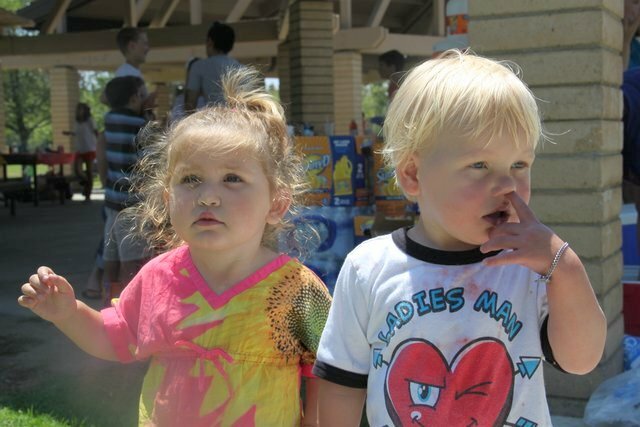 Bodie and his buddy Lorelei. And just in case you were wondering, YES, this was the best picture we could get. I mean, look at what we got last year. At least Bodie wasn't picking his nose this year. Progress, peeps. Bodie, his buddy Tyler (who I've mentioned on the blog before - he's up for his Fontan at CHLA 7/16) and Tyler's buddy, Tanner. 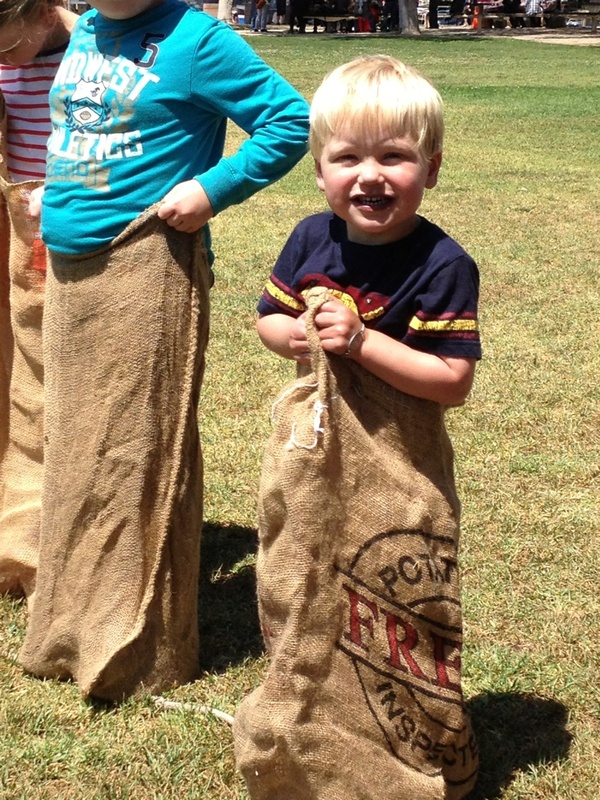 Just a bunch of 3 year olds doing their little boy thing, giggling and loving life. A bunch of open-heart surgeries between them. No big whoop. They're just kids. LOVE their resilience. The kids had SO MUCH FUN. I swear, this event gets more fun every year! I'm also thinking maybe I need to get more creative with Bodie's wardrobe for the event. I don't know whether to be proud or embarrassed that Bodie has wearing the exact same shirt 2 years in a row to the picnic. Not the same shirt in a bigger size. The same exact shirt. But then again...so was Sierra. So I'm gonna go with proud. Because that's just too much embarrassment for one mama.